Masstick is a blend of various highly technical, natural ingredients of marine origin used to provide balanced and natural feed for omnivorous fish and marine invertebrates. 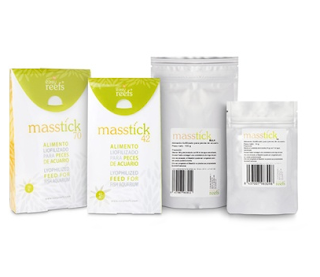 • Masstick does not contain animal or vegetable compounds of land origin, or from sweet water, attractants, artificial preservatives or synthesis products. • Masstick is a self-adhesive paste in powder formula, ready to use once it has been rehydrated. • The rehydratable powder formula allows Masstick to be blended with any mollusc or crustacean pulp as well as eggs from fish, molluscs and crustaceans, artemia, mysids, copepods, rotifers and medicines that are administered orally. • Once prepared and introduced into the aquarium, Masstick does not disperse into the water for hours, so it can be completely taken advantage of by fish and crustaceans. This feature allows the product to be used as “ad libitum” or rationed feeding. • Because Masstick is comprised mainly of freeze-dried crustaceans, it does not contain fish skeletons and is thus very low in phosphates compared to its protein content.